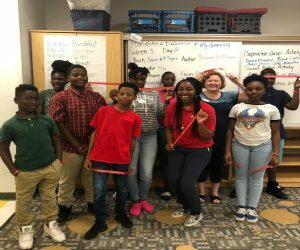 On July 5th MADD staff, Ashley Merrick and Kelly Stafford, spoke to 6th – 8th graders at Chicora Elementary School in North Charleston, SC. Carlton Holland leads a group of youth in a summer literacy program known as Freedom School. The group was reading a book called Tears of a Tiger. The book makes reference to underage drinking, and driving while intoxicated. Carlton contacted his MADD Victim Advocate, Kelly Stafford, to arrange an underage drinking presentation for his students. Unfortunately, Carlton came to MADD after his younger brother, Myles Holland, was killed by an alleged drunk driver in November 2017. Carlton takes any opportunity he can to spread MADD’s mission in the hopes of saving lives. Carlton began the presentation by telling the students about his brother Myles and the importance of riding with a sober driver. Ashley presented MADD’s Power of Youth to the students and they interacted well. The students listened as parents, who lost a child to underage drinking, shared their stories by video. The students were challenged to recall where they had seen people drink or take drugs within their own neighborhood. After the presentation, the students received rubber bracelets with the Power of Youth logo and MADD red ribbons so that they will be reminded of the dangers of underage drinking.